Many years ago, I decided I wanted a fine bamboo fly rod, but back then, money was scarce, and there was no way I could lay out the kind of money it took to buy a custom cane rod. This being the case, I decided to find old cane fly rods and restore them, moving up in quality more and more with each rod until I finally got the kind of Custom Cane Fly Rod that I really wanted. Before long, I found myself immersed in repairing the rods to the point that I was building sections for the older rods. One day it dawned on me, that if I could duplicate the "cheap" fly rods, why could I not duplicate the expensive Custom fly rods... so... I just dove in and started building rods after some of the Classic Tapers. At first I was very happy with the rods I was building, but then realized that nobody (that I knew of, at the time) had ever built a fly rod that exactly suited what I expected from a quality cane rod. This led me to research exactly why bamboo rods react and cast the way they do. After many months of brushing up on Physics and digging through the old textbooks from my Engineering studies, I delved into the formulas originally used by Everett Garrison and used them to develop bamboo fly rods that would cast in a manner that was comfortable for me. The first few were nothing more than test rods and ended up in the trash can at the end of my work bench. After many hours of planing and fighting bamboo, I finally built a rod that cast the way I wanted one to. From that point, it was just a matter of spending a lot of time at the work bench, designing the same action into different length and line weight rods. At the time I was very happy with what I had done, and I thought that I'd figured out the rodmaking business, at least from the craftsman's standpoint... Then along came Ron Kusse... Ron, the former Vice President of H.L. Leonard Rod Company, became a very dear friend and a much admired mentor. He taught me things about making bamboo fly rods that I never imagined. With his advice and help, my rods soon soared to a new pinnacle. Even after producing over 800 rods, I still learn something new from Ron every time we speak. Not only do I learn about the making of the rods, but I learn about the history of rodmaking. My friendship and mentor/student relationship with Ron has been a Godsend. My finishes are better than I ever thought (I didn't think my finish could be improved upon until Ron clued me in on a couple of things). My tapers have evolved to a much more refined and much more pleasurable to cast taper. 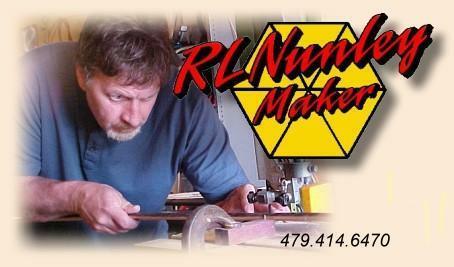 My entire rodmaking philosophy has changed, evolved since my friendship with Ron Kusse began. Well, at this point, 21 years into my rodmaking career, all of my rods are of my own design. I no longer duplicate the classic tapers. If you want a classic taper, I'll be more than happy to recommend a quality rodmaker that specializes in reproducing the classics. I prefer to spend my time forever developing new and better tapers... I say new, but the tapers are anywhere from recently developed to 15 years old. I make rods from 4'4" to 8'6" in length ranging from 3 weight to 6 weight. You can see the list of rod models and prices on the pricing page. Since the last time I updated this page, things have changed a bit in my life. First, I got married! To make a long story short, I reunited with my high school sweetheart and in December 2007 we were married in Mountain Home, Arkansas, near the banks of the White River and the North Fork of the White. 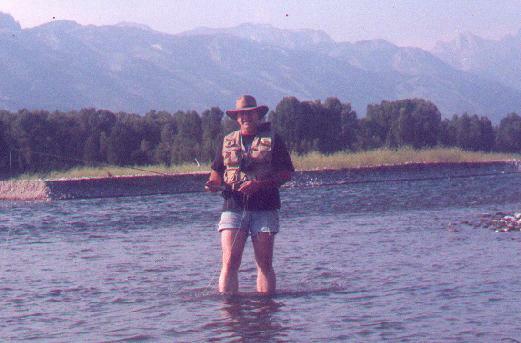 Of course, my ideal wedding would have been in waders, standing in ice cold water with all of my friends and a choir of trout looking on, but hey, close to the river will have to do! Even though I did change the address on the contacts on the website, I guess many didn't know that I moved from my long time home in Southeast Oklahoma to Mountain Home, AR. I absolutely love it here. I have fished this area for about 20 years and if I'd known how much I would like it here, I would have moved years ago. My friendship with Ron Kusse continues to grow. In the summer of 2008, Rita and I drove to New York and spent a week with Ron and Peachy. We enjoyed the visit so much that we've even discussed moving to the Catskills after Rita's daughters are grown (oh, yeah, I was out of the kid raising business there for awhile! My boys are grown, but Rita has three daughters still at home... raising girls is a WHOLE different world than raising boys). I must say that I fell in love with the Catskills. I will return... next summer. I've even talked to Rita about flying up by myself this fall and spending a couple of weeks with Ron, working in his shop and fishing, but I'm due another revision on a knee replacement, so those plans are in limbo for now. The new knee is in and works great! I had the surgery done the day before Thanksgiving in 2008 and I'm back to wading and beating the rest of my body up on the rocks and waterfalls. Unfortunately, my wife, Rita, had a battle with her health this spring, so that cut back on our travel time, but we did manage to make it to Colorado for the Colorado Rodmaker's Reunion. While there, I added another friend to my list of "people I'll never forget". Bob Taylor, formerly of the HL Leonard Rod Company and Thomas & Thomas and I have become friends. We met at the Colorado Rodmaker's reunion and instantly hit it off. We sat on an expert panel at the Reunion and spent a lot of time before and after the panel taking rods, Payne, Edwards, T&T, Maxwell, Leonard, Kusse, Aroner and a few things we just won't mention on the website! Bob is a GREAT guy and I'm proud to count him among my friends. I'll update this page as life evolves, or as my work evolves. Thank you for reading and I hope you found something of interest in this brief history of my life as a rod maker .